I've been hearing the same stories for years about how pressured elk just move away from callers. I also hear from people who do call in bulls with cow calls AND with aggressive bugling tactics. My experience includes all of the above. Last year I called a nice 6X7 bull early in the season and arrowed him at five yards. All I used was a pleading cow call. When he tried to call me to him, I shut up and he came to me. I have also called big bulls right up to me with bull sounds that are meant to communicate a call for cows to come to the bull. Bulls want to know who it is that is in his area "calling cows" to himself! In my own experience, it has been productive to call bulls up close for a shot during the first couple of weeks of archery season, but I have also had them come screaming in during the peak of the rut. The peak has past, but that doesn't mean the rut is over. At this time of year keep trying to entice bulls with various cow talk sounds and add some realism with bull sounds. There will be cows who go into second estrus that were not bred during their first. There will also be cows who simply haven't gone into estrus yet. The best thing we can do is learn what all the nuances of elk communication mean and how to "communicate" effectively ourselves. I annually study ElkNut's calling and hunting teaching resources. Paul knows the "language" and teaches it on various DVDs, the Playbook and audio CDS. Elk Nut products are available with free shipping here. It is feasible to sneak in on big game animals, including elk herds. 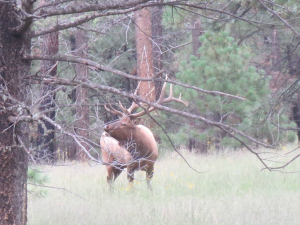 A silent stalk into an elk herd is not as nearly impossible as some might think. Of course, you have to develop and use some good skills, take it very slowly and respect the wind. It's hard work and takes a lot of time. Sometimes you have to cloverleaf around when the wind is contrary. In the end, all of that effort and time sometimes results in hooves throwing dirt all over the place. I've experienced that more times than not. I am getting better at it with practice, however. I did it three times this September without getting caught. The end result was a filled freezer. I was working on a bull that was clearly a herd bull for several days. To be honest, I had him OR the satellite bulls harassing him as a goal. Heck, I'm a meat hunter. If a cow elk makes me shoot her, I'm up for that. But this year I had an ulterior motive for trying the silent stalk. I announced a few months ago that I was sold on the science of the HECS Stealthscreen and would be trying it for the first time this year. I wanted to give the suit a good run. I was experiencing the same frustrating scenarios where the herd bull was not interested in any cows, but his own. The satellite bulls were determined to take some away from him and were focused on one of his estrus screaming cows. I decided the only way to get a shot was to sneak in and either ambush him or a satellite, or piss him off with an aggressive challenge bugle once I got in his living room. Elk Nut discusses this technique and other options thoroughly in the Playbook. On this particular day, I got to within 75 yards, but it was too open to get any closer. In the end, I decided to try again the next day. I wanted to give the HECS suit a good try, so I decided to stalk in silently as close as I could get. I heard the same bull and started the stalk without calling. I saw cow elk moving the opposite direction to my right, so I redirected and worked to get in front of them while they were feeding slowly. Both of these two days, cow elk looked at me when they caught me moving slightly, then went back to eating. With the HECS suit on, it was looking good for avoiding the dreaded game of "stare and statue" that usually ends up with elk exiting the scene. I began to feel comfortable that, as long as I didn't get caught making big movements like walking, everything would be fine (given favorable wind). The herd I stalked into this time was devoid of the herd bull. I had picked a small group of cows and a young raghorn. I figured I was there, so I might as well get as close as I could to try the HECS suit thoroughly. I stalked to within 25 yards of some of the cows. I set up behind some brush that would place me in view of where they would feed out of the brush. Some more cows and the bull were out at 55 to 70 yards. Those were the elk I was worried about, because they had a clear view of me. Several times they caught my arm and hand movements with their excellent peripheral vision. Each time one looked at me, I froze and they very quickly went back to eating. I was careful to keep them from seeing my close-set eyes, a sure sign of "predator" to ungulates. There was a big cow that I kept ranging at 60 to 65 yards. She kept catching my movement and relaxing back to grazing. I was tempted to shoot her, being the larger cow, if she got in range before the closer elk stepped into view. When she was 55 yards away, I decided just to see what it would feel like to put a pin on her at full draw. I had plenty of time and remembered how well I was shooting on my range at 60 yards. I released the arrow and heard a loud thump as one of her broadside ribs broke. She flinched and stood there. The elk around her reacted to the thump. Some looked over toward the sound of my releasing bow noise. They soon turned their attention to the weird acting cow, who eventually walked a few yards and laid down for good. The other elk slowly walked away. I didn't get to spend a lot of time trying the HECS suit, because I killed one when it was working! I had some positive experiences with mule deer while I was elk hunting this year, too. One looked at me for a second from ten feet away and bedded down right next to me! My skepticism has been replaced with confidence. Obviously, it's not necessary to have a HECS suit on to be able to successfully kill elk, but I like the advantage it provides. I won't be without it on future hunts. If you want more information see our HECS Stealthscreen page. You might want to start your elk hunting planning early by trying the 60 day free trial membership with Huntin' Fool. You can get a lot of questions answered about where and how to hunt in big game country. Even the free trial will give you access to some incredible data about big game hunting the west and some eastern states and Canada. If you do decide to pay the $100 basic or $200 premium annual fee, Huntin' Fool has agreed to provide a 20% ($20 or $40) rebate toward anything sold on ElkHuntingTips.Net! You have to use this link. Or, the link on our page that discusses Huntin' Fool more thoroughly. Then, please let us know when you order something, so we can apply your discount to your purchase for you.